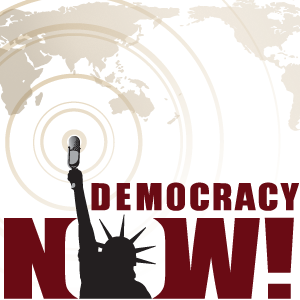 This article originally appeared in openDemocracy. Known as the “Fortunate Islands” to ancient Romans and idealized throughout history by the likes of Homer and Shakespeare, the Canary Islands boast a world-class reputation as a tourist destination and host treasured second homes to many northern Europeans. For the local population, however, the current economic crisis hitting the islands is rapidly turning life in Spain’s Eden-like archipelago off the coast of Africa into an unforgiving inferno. Map of the Canary Islands (Wikimedia Commons – click to enlarge). With a contracting economy and an active population jobless rate above 27 percent, the highest in the industrialized world, Spain also ranks as the OECD nation which saw the greatest increases in inequality between 2007 and 2010. As the country continues to sink into economic depression and social impoverishment, these record numbers have long been surpassed in some of its regions. Such is the case of the Canary Islands, the European Union’s outermost territory, where the current socioeconomic indicators tell a story of imminent turmoil: a 38 percent poverty level, the highest in the country, and an unbridled 34 percent unemployment. Indeed, while last May’s more benign official poll measuring registered unemployment showed a sixteen-year national drop, the Canary Islands emerged as the only Spanish region where the number of people registering for jobless benefits continued to rise. 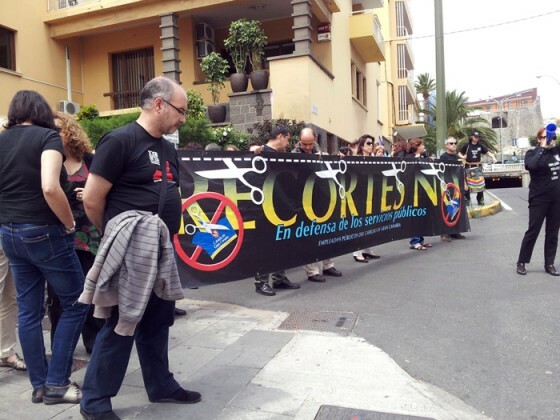 Workers Day Protests in Gran Canaria (photo: J. Luis Martín – click to enlarge). As an estimated 26,000 Canary Islands families have no income whatsoever and 24 percent of the local population (2.1 million) has received some form of assistance from the government’s social services programmes in the past year, one of the most pressing issues associated with the region’s economic downfall is the increase in child poverty. According to UNICEF’s 2013 report on the Canaries, child poverty has reached 29 percent. The report not only underlines the worrying hike in the number of poor children (as many as 112,000 were recorded back in 2010), but also that they are becoming poorer. These figures are best illustrated in the islands’ public school dinners, where some 12,000 children were pulled out of this service over the past year as their parents were no longer able to afford it. 6-year-old María is one of those thousands of children in the Canaries who are no longer able to pay for lunch at her public school. She and her parents are experiencing an unimaginable path to poverty that is becoming alarmingly common to the Canaries’ perishing middle class: the islands’ so-called ‘new poor’. María’s mother, Carolina (39), has worked as an administrative assistant in the island of Gran Canaria for the past thirteen years. Like the other 10,000 companies in the islands which have shut down during the crisis, her employer’s business is now in the process of closing shop. It’s been months since Carolina last received her 790 euro monthly salary in full. Her last paycheck came in April, only days before her company filed for voluntary bankruptcy, and all she received was half of her salary. To make matters worse, her husband, Francisco (41), an unemployed sales professional, has just exhausted his unemployment benefits. Currently, their only means to make ends meet are Carolina´s mother and siblings. “My mother lives on a small pension, and my brothers have problems of their own, but without their help we would simply not be able to eat,” Carolina explains. “It is all very difficult now. Our situation seems to worsen by the day and it is very frustrating to spend money on transportation to go to work without knowing when I’ll get paid.” Carolina, like the other 200 employees at her workplace, hopes that her company´s legal ordeal will pass soon and that they will get severance and unemployment benefits without too much delay. “That way at least I´ll be able to spend time trying to find a new job,” she explains. For his part, Francisco continues his now two-year long job search. He says he has sent hundreds of cv’s and that finding a job and caring for his daughter at home has been his only occupation. A recent study conducted by Visa Europe estimates that Spain’s black market economy amounts to over 200 billion euros, nearly 18 percent of the country’s GDP. In the Canary Islands, the underground economy represents a higher share at 28 percent. Although Carolina’s daughter is certainly affected by the household’s sudden impoverishment, her situation is not yet as bad as that of many other children in the Canaries for whom the school dinner offers the only chance to eat a full-meal during the day. As the problem of child poverty continues to grow, the islands’ regional government has announced plans to expand the financing of public school dinners in an effort to bring back some of the children. Indeed, at some school districts, the unemployment rate is as high as 70 percent, so the need to widen access to public school dinners is a social emergency. In addition, the government says it is working on a “plan against poverty,” which is to include the opening of 182 public schools this summer to keep the dinner services going and the children fed. Cáritas Diocesana is a Catholic relief charity that helps the poor. Its chapter in the Canary Islands, consisting of 1,205 volunteers, stands out as one of the most recognizable local non-government organizations, which are filling the welfare void left behind by an overwhelmed system of public social services. In 2012, Cáritas assisted over 46,000 people in the Canaries in providing them with shelter, food and medicines, among other provisions. “The cases of ‘new poor’ families like the one you mention are indeed becoming very common,” says Cáritas’ Institutional Development Coordinator for the province of Las Palmas, Elena Henríquez. Besides having little or no knowledge about where or how to ask for assistance, the islands’ ‘new poor’ are also unwilling to come forward because they feel ashamed of their situation, as well as fearful of the potential consequences of telling social workers about their financial troubles. “Not having a job makes them feel like social outcasts. They feel less worthy” says Henríquez, “but they are also scared to ask for help, because they think that by exposing their poverty to social services they might have their children taken away [by the government].”By the time these once middle-class income families knock on Cáritas’ door, they are in a truly desperate state. Canary Islands’ Red Cross volunteers (photo: Luis Camejo – click to enlarge). Man searching for food in a garbage dumpster (photo: J. Luis Martín – click to enlarge). While most people think of the Red Cross’ humanitarian activities as taking place abroad, the reality is that, in Spain, 80 percent of its resources are dedicated to assisting Spaniards. The organization’s focus on caring for the country’s own population has surged since 2008. Already this year, requests for assistance have jumped 86 percent. Besides distributing food, the Red Cross is helping impoverished Canarians with ‘school kits’ containing notebooks and pencils, soap and personal care items, food vouchers, shelter for the homeless, and even money to pay water and electricity bills. “If there is need, we are there,” states Campos Pineda. In light of the deteriorating situation in the islands, the Red Cross has recently launched a three-year programme entitled “Now More Than Ever” aimed at intensifying its assistance for the poor and for children. David Muñoz is president of the Official Professional College of Social Workers in the Las Palmas de Gran Canaria province. As head of the institution which represents 1,300 of the islands’ 3,000 social workers, Muñoz is concerned about the adverse effects the combined economic crisis and government cuts are having in the country’s welfare state. According to him, Spain is experiencing a reversal in terms of the country’s hard-won welfare state system whereby rights and social justice are being handed back to charities, as was the case in pre-constitutional Spain, over 35 years ago. 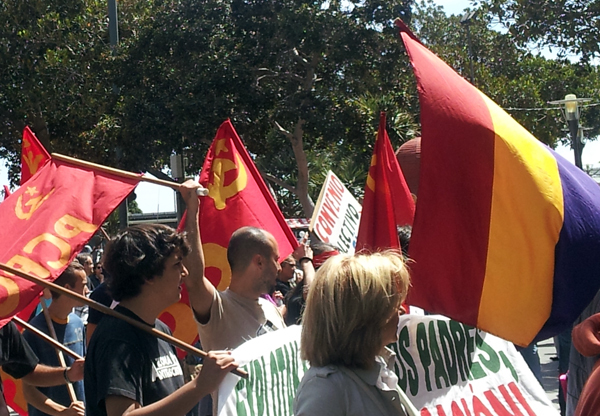 Public workers protest against austerity cuts (photo: J. Luis Martín – click to enlarge). While children are the most vulnerable victims of the economic crisis in the Canary Islands, the prospects for young professionals who are supposed to succeed the outgoing generation is also alarming. 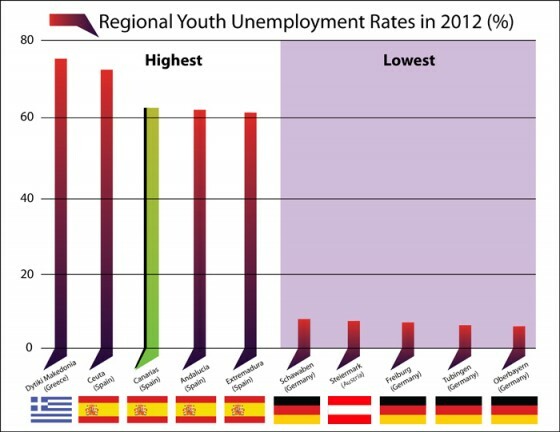 At 62.5 percent, the youth unemployment rate in the Canaries is Europe’s third-highest after Western Macedonia in Greece (72.5 percent) and the Spanish region of Ceuta (70.6 percent). The islands’ regional government’s most recent poll on the Canary Islands’ youth, however, reports that the actual unemployment rate among this segment of the population is as high as 73.3 percent. According to the same poll, 26 percent of all previously independent young people have returned to live with their parents, 4 out of 10 young people still live with them, and 28 percent of all young people living with their parents have children of their own. As a consequence of such a desperate scenario, the better-qualified and most tenacious young men and women are leaving the islands. The poll also indicates that 83 percent of the region’s youthful population is willing to seek a future away from the archipelago. 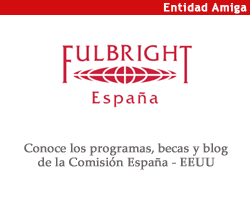 According to a recent survey by the Real Instituto Elcano, a Spanish think tank, 65 percent of the country’s prospective young emigrant population has a bachelor’s degree. Euro zone youth unemployment rates by region (source: Eurostat – graph: Ricardo de Silva – click to enlarge). Similar to other Spanish regions, over the past decades the Canary Islands enjoyed the economic windfall that came with millions in structural and cohesion funds from the EU and the flood of cheap money that flowed after the country joined the European single currency. Largely due to their almost absolute dependency on tourism and construction, growth has never been linear in the Canaries and the burst of the Spanish real estate bubble has shattered the region’s labour market for years to come. Such a dependency on tourism and construction was heightened by the region’s geographical uniqueness, lack of sustainable energy sources, absence of innovation, and years of its entrenched political leaders’ long-term relationships with each other and with the central government. Maspalomas (Gran Canaria). The Canary Islands archipelago is a major tourist destination with over 12 million visitors per year (photo: J. Luis Martín – click to enlarge). Ultimately, the path to overcome the current economic crisis in Europe’s ultra-peripheral “Fortunate Islands” is similar to that of Spain as a whole, and even some of the European project’s weakest nations: to engage in the profound transformation of the current fatigued and unsustainable economic model. This is a rather titanic endeavour, however, in the midst of a currency crisis that is pulling at the seams of the eurozone’s divergent economies.